Mridula Ramesh is the founder of the Sundaram Climate Institute, which focuses on waste and water solutions and education. She is an active angel investor in cleantech startups, with a portfolio of over a dozen startups. 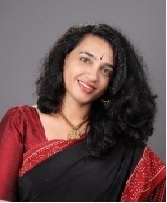 A graduate with distinction of Cornell University, with an MBA from the Kellogg School of Management, Mridula worked at McKinsey in Silicon Valley before returning to India. Leveraging on her two decades of management experience, she teaches a postgraduate class on climate change at the Great Lakes Institute of Management and is a regular columnist for Firstpost on Climate Change and has written earlier extensively for the Hindu. She is the Executive Director of Sundaram Textiles and lives and experiments in Madurai in a net zero-waste house with her husband and two children.